Begin your child's love of learning in a Weatherford ISD elementary school by enrolling them in Kindergarten for the 2019-2020 school year! 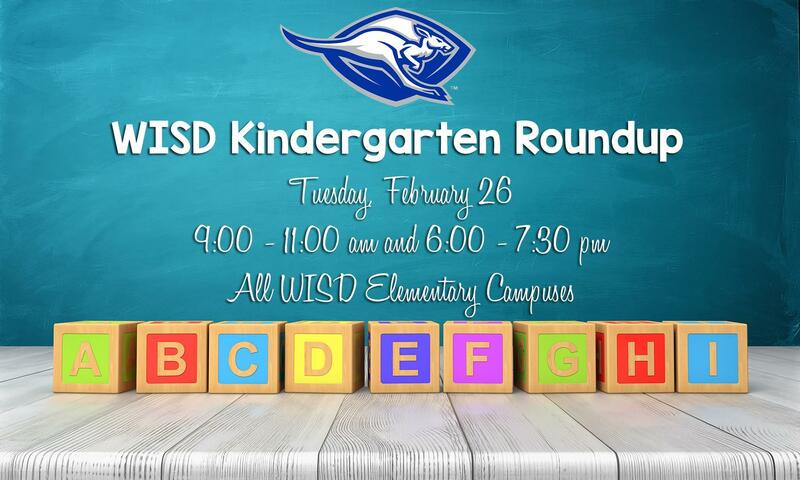 Kindergarten Round Up on Tuesday, February 26, 2019, provides parents their first opportunity to enroll children in Kindergarten. Parents are invited to enroll their child at a WISD elementary campus on Tuesday from 9-11 am and 6-7:30 pm. Online Registration: Parents may submit the registration paperwork online starting February 15, 2019, and then contact the school to schedule an appointment for February 26th or afterwards to complete the registration process. Please see the documents linked above for specific enrollment information. To find the elementary campus your child will attend, please click HERE and enter your home address. New family to Weatherford ISD -- Click on the following link (starting February 15, 2019) to request a Skyward account in order to complete the online registration documents. After you receive your log in information, you will be directed to the application program. Family with other students currently enrolled in Weatherford ISD -- If you have other students who are currently enrolled in Weatherford ISD, you may log in to Skyward Family Access starting February 15, 2019, to enroll your Kindergarten student. Look for the menu options on the left side after you log in to the system. If you have lost or forgotten your log in information, please contact the school of your currently enrolled child and they can give you that information. If the wrong Kindergarten campus is listed for your child, please contact the campus office and they will verify the appropriate campus based on your address. Our kindergarten program is designed in a way that allows teachers to differentiate instruction so they can focus on the individual needs of each student. Our teachers strive to provide the most effective individualized instruction while nurturing each child's unique talents and abilities to make sure they feel special and loved. Special subjects like PE, music, technology, and library provide a fun and creative outlet for kindergarten students. Weatherford ISD provides your child with a positive environment where they can thrive academically, socially, and emotionally. We welcome parents as volunteers and encourage you to be an active part of your child's education - both at home and in the classroom. Enjoy the convenience and security of your child remaining at their neighborhood school all day. The KIDS UNITE after-school program is available at each elementary campus in Weatherford ISD to provide a safe, fun, nurturing, educational, and convenient setting for children to extend their learning beyond the regular school day. For more information, please visit our KIDS UNITE page by clicking HERE. We look forward to serving your family for the 2019-2020 school year!